A lack of senior leadership shouldn’t be a problem for McNary’s lacrosse teams this spring. The boys bring back 10 seniors while the Lady Celts have eight on their roster. “We only lost one senior last year so we have a really good set of returners, who were also able to get our freshmen to start practicing earlier and our other newbies to start practicing earlier so the standard of play is higher at the beginning of the season, which is awesome,” McNary head girls coach Rebecca LaFramboise said. The Lady Celts return leading scorers Carly Levario, Jessica Grimmer, Ashley Setzer and Katelyn Martinez. 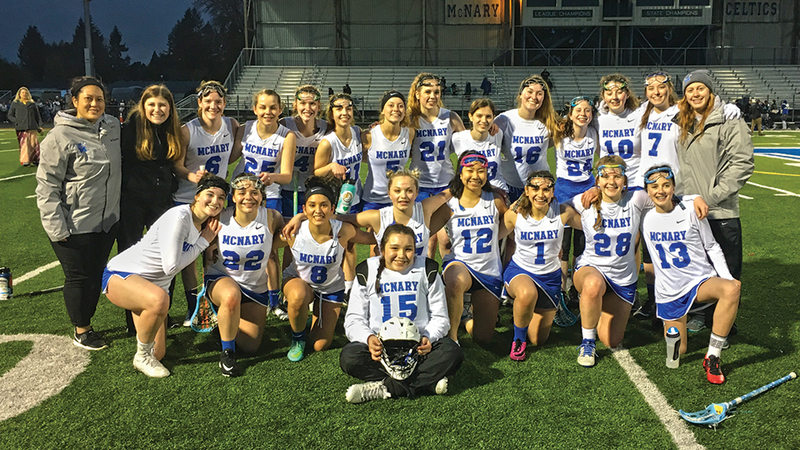 Grimmer and Martinez each scored four goals on Tuesday, March 13 as McNary opened the season with an 11-7 win over Thurston. Kylee Daulton and Payton Wirt are also back at goalie. “I expect us to have more movement of the ball and more possession,” LaFramboise said. McNary has 18 girls in the program, which is in its second year as a varsity team. McNary’s boys return two First Team all-league selections from last season in leading scorer Jonathan Williams and goalie Marcus McCoy. Both, along with Chad Pinney, who was second on the team in goals scored last season, and Kory Pagels, are seniors and have played on the varsity squad since they were freshmen. “It’s a very large senior class and they want to run all day so we try to keep them together,” Celtics head coach Michael Hochspeier said. Jack O’Connor, Second Team all-league last season, is also back. With so much experience, McNary has set a goal to win the league and get a home playoff game. The Celtics finished third behind West Salem and Sprague last year. McNary opened the season with an 8-6 loss to Newberg on Wednesday, March 14. The Celtics next home game is Wednesday, April 4 at 5:45 p.m. against Chiawana, Wash. The Lady Celts host Corvallis on Thursday, April 5 at 6:30 p.m.